This is now available at our Etsy Store! Ahhh baby showers! Tis the season? It sure seems so for me! All joking aside I think I figured about 10 of my close friends are either pregnant as we speak or have just delivered a little bundle of joy. Phew! A sweet friend of mine just had her baby shower last weekend. We were discussing how exactly it is we are related and decided to just go with "cousins" because, well...it would make explaining to people a lot easier! In actuality, it is our husbands who are the cousins but being sisters in Christ- we are related as well! Back to the cake! 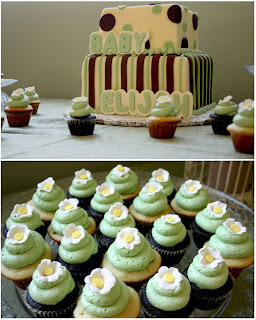 I was so very honored to be asked to do their baby shower cake- excited, to be exact. I couldn't wait. As we hashed out details, I became even more determined to make this thing rock! The couple (who were having a co-ed shower- cool huh?!) wanted a two-tiered cake: the bottom tier was to be an 8" square and the top was a 6" square. Each tier was made of our popular vanilla bean cake with vanilla bean buttercream frosting and then was to be covered in ivory fondant and decorated in a way that went with their theme of the party. 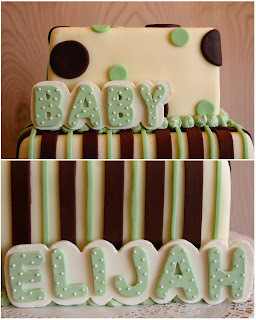 The mom-to-be wanted stripes along the bottom tier in both chocolate brown and sage green and the top was to have the same colored polka dots. 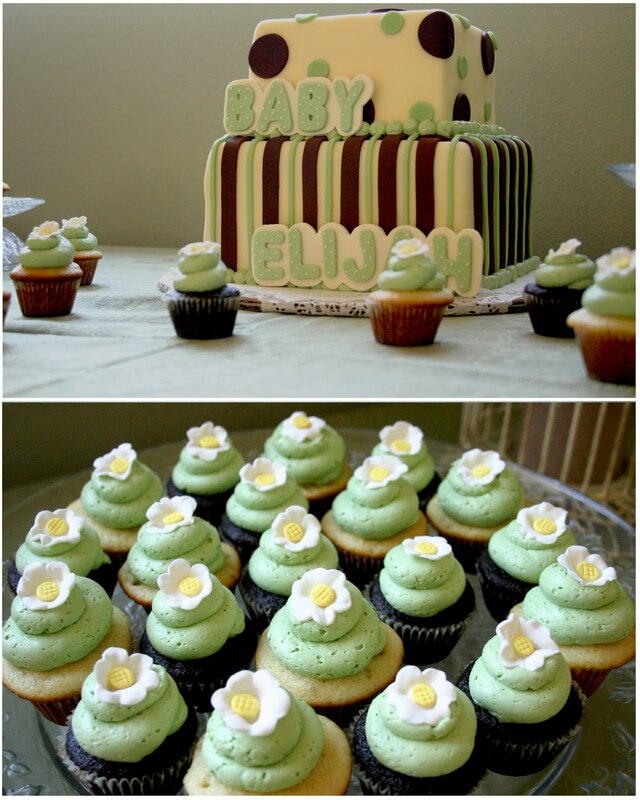 The best part though- the name plaque they wanted on the cake- "Baby Elijah" was to be somewhere. Going along with the cake were 4 dozen of our vanilla and chocolate tinis- both with sage green vanilla buttercream frosting and our handmade edible flowers. Yum! Did I mention there were 70+ people there? I quickly got to work planning and drawing out exactly how I wanted to structure, make, and decorate this cake. The tinis were no problem at all, so my main focus was the big boy- the cake. I couldn't be happier with how it came out! What do you guys think? I'd love to hear!! Using the artistic talents of my husband, we created a personalized and very sweet name plaque out of gum paste and royal icing, to be used on the cake the day of the shower. Don't forget- no cookie cutters were used! Each letter was drawn by hand, a stencil was then made, and each letter was cut out! I then added the super cute swiss dots to complete the whole look. So, thank you Mike and Stephanie for trusting in my work and having faith in me! I can't wait for the next!